ICTACT Journal on Communication Technology (IJCT) is a peer-reviewed International Journal published quarterly. IJCT welcomes Scientists, Researchers, Engineers to submit their original research papers which is neither published nor currently under review by other journals or conferences. Papers should emphasize original results relating to the theory and/or applications of Communication Technology. Review articles, focusing on multidisciplinary views of communication, are also welcome. The Journal will highlight the continued growth and new challenges in Communication technology, for both basic research and application development. 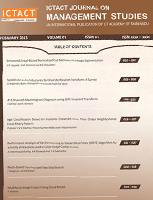 ICTACT Journal on Image and Video Processing (IJIVP) is a peer – reviewed International Journal published quarterly. IJIVP welcomes Scientists, Researchers, Academicians and Engineers to submit their original research papers which is neither published nor currently under review by other journals or conferences. Papers should emphasize original results relating to both theoretical and application issues of Image and Video Processing. Review articles, focusing on multi disciplinary views, are also welcome. ICTACT Journal on Soft Computing (IJSC) is a peer – reviewed International Journal published quarterly. IJSC welcomes Scientists, Researchers, Academicians and Engineers to submit their original research papers which is neither published nor currently under review by other journals or conferences. Papers should emphasize original results relating to both theoretical and application issues of Soft Computing. Review articles, focusing on multi disciplinary views of Soft Computing, are also welcome. 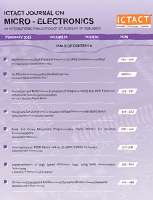 ICTACT Journal on Microelectronics (IJME) is a peer – reviewed International Journal published quarterly. IJME welcomes Scientists, Researchers, Academicians and Engineers to submit their original research papers which is neither published nor currently under review by other journals or conferences. Papers should emphasize original results relating to both theoretical and application issues of Microelectronics. Review articles, focusing on multi disciplinary views of Microelectronics, are also welcome. ICTACT Journal on Management Studies (IJMS) is a peer-reviewed International Journal published quarterly. IJMS welcomes Entrepreneurs, Managers, Practitioners, Scholars, Academicians, Professionals to submit empirical or theoretical articles, case studies, original research papers which are neither published nor currently under review by other journals or conferences.